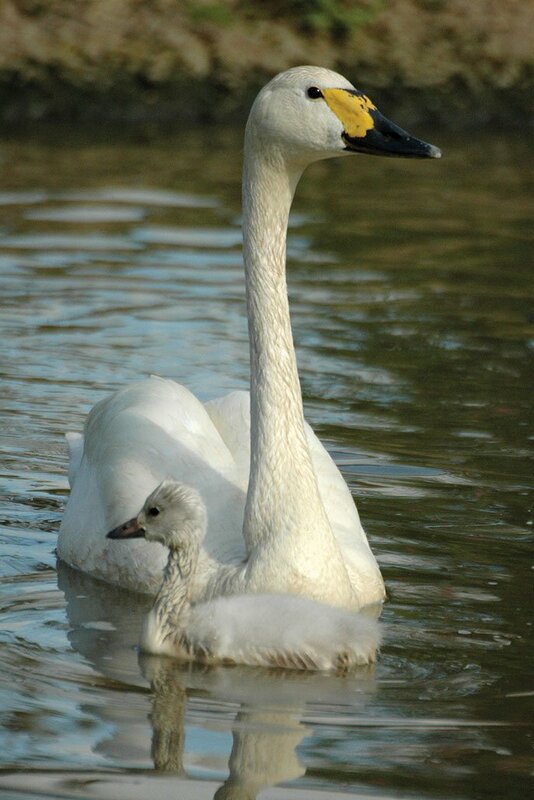 The Bewick’s Swan is one of the smaller of the swan species. Adult birds have uniformly white feathers and distinctive black-and-yellow markings on their bill with the yellow ending behind the nostrils. This pattern is so distinctive that birds can be recognised individually. They have short, straight necks, round heads and black legs. Juvenile birds have grey feathers and a pinkish bill becoming black towards the tip. The birds’ juvenile plumage gradually becomes whiter as the winter progresses. Birds in their second and sometimes third year may retain some grey feathers on their head and neck and pink patches on the bill. The Bewick’s Swan has a soft bugling call with musical notes. They are very vocal throughout the year, especially when on water and in flight. Calls are used for a range of territorial and contact purposes. Loud calls are used during threat and triumph ceremonies, quieter but persistent calls are used to locate mates and as pre-flight signals, honking calls are used in flight while gentle babbling calls are common during resting. Bewick’s moult their flight feathers in July-August every year. Bewick’s Swans spend the summer in arctic Russia, on a narrow band of tundra stretching from the Kanin Peninsula west to the Chukotka Sea. Three populations have been identified based on their winter distribution: the Northwest European, the Eastern and the Caspian. Northwest European population This population breeds to the west of the Ural Mountains in the Russian arctic and winters in Northwest Europe, mainly in the Netherlands, the UK and Germany, with smaller numbers found in Belgium, Denmark, Sweden, France and Ireland. There are important staging sites in the Netherlands, Germany and the Baltic countries, especially Estonia in both spring and autumn and the White Sea region in the spring. Eastern population This population breeds in eastern arctic Russia and winters mainly in Japan, China and Korea. 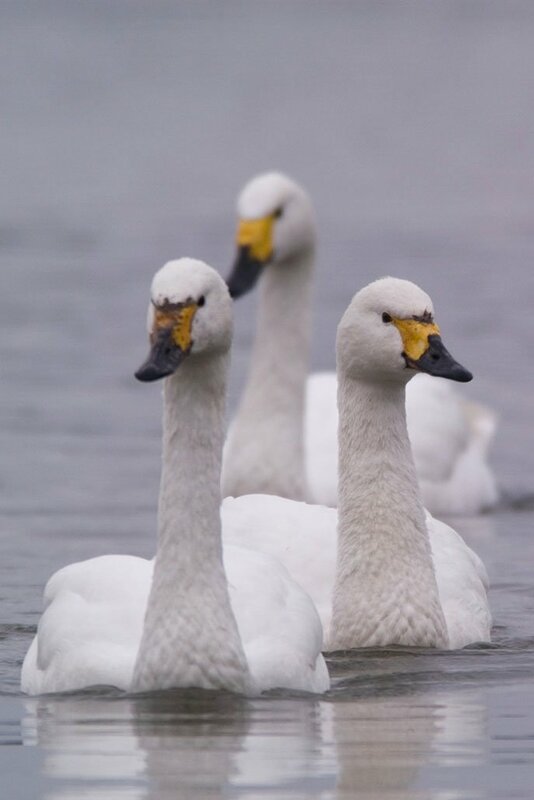 Although the boundaries and extent of any overlap of Bewick’s Swan populations in the breeding range is still not known, it is generally held that those breeding to the east of the Lena Delta are Eastern population birds. An estimated 75% of the population winter in the Yangtze River floodplain in China (Cong et al. 2011).Historically the population was more widely distributed throughout the floodplain but now most of the population is confined to five wetlands in Anhui Province and to Poyang Lake in Jiangxi Province, where the majority (up to 113,000 birds) occur. In Japan, where supplementary feeding of swans commenced in the mid-20th century to aid the survival of birds in winter and which now occurs at many traditional and man-made wintering sites, numbers increased steadily during the 1980s–1990s, with over 30,000 wintering in the country by the early 2000s. The species was formerly numerous in Korea, but fewer than 100 birds are now thought to occur there annually. Caspian population The breeding range in arctic Russia is unknown but is thought to fall just to the east of the Ural Mountains in arctic Russia. Swans from this smaller population winter in and around the Caspian and Aral Seas, and in smaller numbers in Iran, Turkey and the Ukraine. There is likely to be some cross-over between the Northwest European and Caspian populations. There may be some overlap in the distribution of the three populations in arctic Russia during the summer time. From: (1) Rees & Beekman 2010, (2)Beekman et al. 2015, (3) Wetlands International 2018, (4) Syroechkovski 2002, (5) Cao et al. 2008, (6) Cong et al. 2011. The Bewick’s Swan breeds adjacent to shallow lakes and pools on the arctic tundra, particularly on sedge-grass and moss-lichen tundra dotted with numerous small lakes and pools, and also in some dry land areas with willow bushes. It rarely nests in shrub-tundra and occurs only as a migrant in forest tundra and taiga zones. At the breeding grounds it feeds mostly on sedge, arctic grasses and other herbs and berries when on land, and on algae and Potamogeton when on water. On migration the species requires a chain of stop-over sites including shallow coastal lakes with soft sediment and good water quality as well as flooded grasslands. In winter the species traditionally occupies shallow tidal waters, coastal lagoons, inland freshwater lakes and marshes and flooded pastures, where they mostly feed on the tubers and rhizomes of Potamogeton spp., on Zostera spp. and on Chara spp., and also on grasses and herbs. From the 1970s onwards, an increasing proportion of the Northwest European population has fed on arable land during the winter, particularly on stubble fields (in autumn), winter cereals, and the post-harvest remains of potato and sugar-beet crops, with maize fields also increasingly used in recent years. Protected under the Agreement on the Conservation of African-Eurasian Migratory Waterbirds (AEWA, 2015), Appendix II of the Convention on the Conservation of the European Wildlife and Natural Habitats (Bern Convention), Appendix II of the Convention on Migratory Species (CMS or Bonn Convention), and Annex I of the EU Birds Directive Wildlife and Countryside Act (1981). 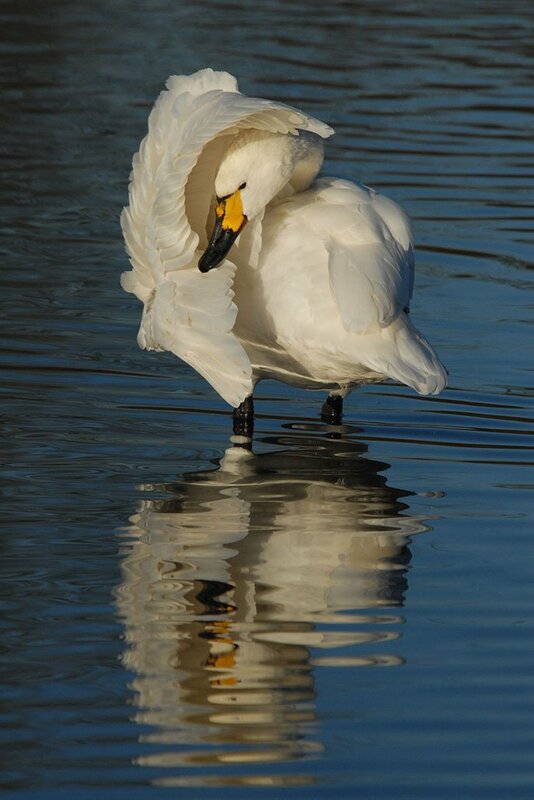 An International Single Species Action Plan for the Conservation of the Northwest European Population of the Bewick’s Swan, which declined by 27% between 1995 and 2005, was adopted by the 5th Session of the Meeting of the Parties to AEWA in May 2012 (Nagy et al. 2012). Despite legal protection, the swans are hunted (either deliberately or accidentally) for sport and food. 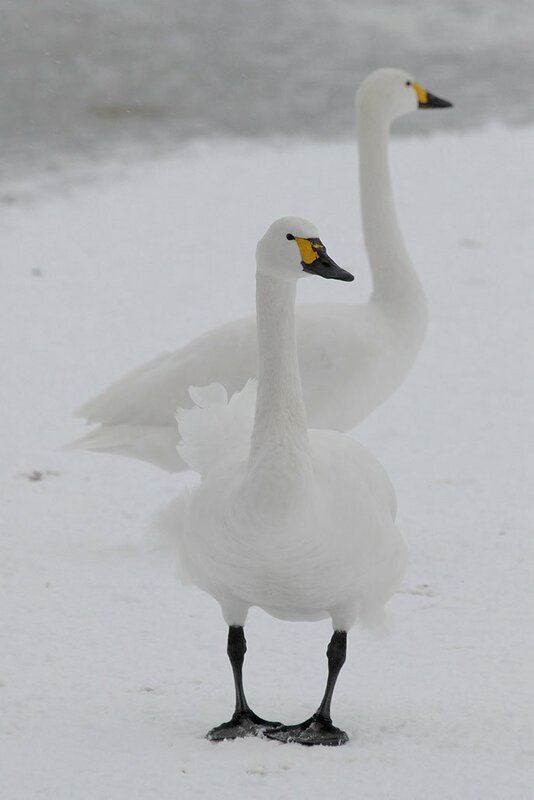 Climate change may result in loss of optimal habitat and also in severe, fluctuating weather conditions, which may influence the swans’ breeding success and survival rates. Collision with powerlines is the most frequently reported cause of death for swans wintering in northwest Europe. Lead poisoning (resulting in morbidity and death) occurs following the ingestion of lead shot or lead fishing weights as grit, or through feeding in lead-contaminated sediments. The concentration of Bewick’s Swans in large numbers makes them intrinsically vulnerable to infectious diseases such as botulism, duck viral enteritis and avian influenza. Arctic breeding habitat is threatened by oil and gas leaks. Continued eutrophication, pollution and drainage of wetlands remain a threat at staging and wintering sites (Kear, 2005; Nagy et al. 2012). Albertsen, J. O.; Kanazawa, Y. (2002). Numbers and ecology of swans wintering in Japan. Waterbirds 25 (Special Publication): 74–85. Census in northwest Europe. Swan News 11: 13–15. Cao, L.; Barter, M.; Lei, G. (2008). New Anatidae population estimates for eastern China: implications for flyway population sizes. Biological Conservation 141: 2301–2309. Cong, P.H. ; Cao, L.; Fox, A.D.; Barter, M., Rees, E.C. ; Jiang, Y.; Ji, W.; Zhu, W.; Song, G. (2011). Changes in Tundra Swan Cygnus columbianus bewickii distribution and abundance in the Yangtze River floodplain. Bird Conservation International 21: 260–265. Kear, J. (2005). Ducks, geese and swans of the world. Volume 1. Oxford University Press, Oxford, U.K.
Rees, E. (2006). The Bewick’s Swan. London, UK: T. & A.D. Poyser. Rees, E. C.; Beekman, J. H. (2010). 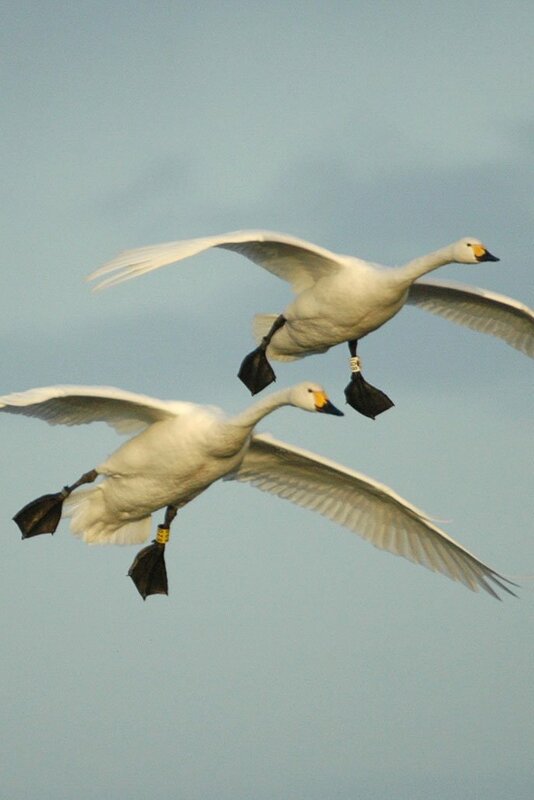 Northwest European Bewick’s Swans: a population in decline. British Birds 103: 640– 650. Syroechkovski, E.E. (2002). Distribution and population estimates for ewans in the Siberian arctic in the 1990s. Waterbirds, 25 (Special Publication 1): 100–113. Wetlands International. (2018). Waterbird Population Estimates. Accessible at wpe.wetlands.org [Accessed Feb 2018].